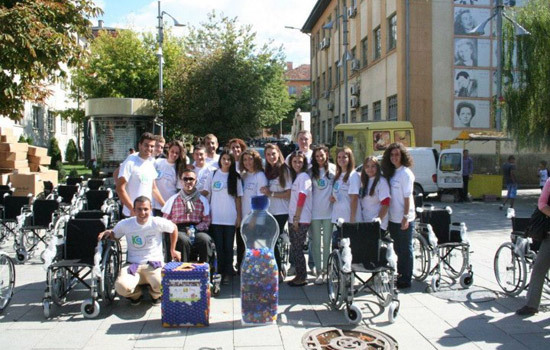 American University in Kosovo students helped people who need but cannot afford wheelchairs by recycling plastic bottle caps. On Sept. 21, American University in Kosovo students organized the “Opening Day” of the first 50 wheelchairs that have arrived as a result of the Kosova Cap Project. Kosova Cap Project is a humanitarian project that aims to help people who need but cannot afford wheelchairs by recycling plastic bottle caps. The project is implemented by American University in Kosovo Charity Club and Green Club — two community organizations founded and led by Kosovo students. The project officially started in December 2011 under the initiative of senior student Korab Ahmeti. About 25 of the wheelchairs were a result of plastic caps collected since then. The other wheelchairs were donated by Kushtrim Ahmeti, a Kosovar currently studying in Turkey and who was one of the initiators of the Cap Project idea. On Sept. 24, wheelchairs were donated to 10 families living in the Prishtina and Fushe Kosove regions. Student volunteers will donate the remaining wheelchairs to the other cities until all 50 identified families in need receive the wheelchairs. Families identified live in Prishtina, Fushe Kosove, Peja, Ferizaj, Gjilan, Mitrovica and Shtime. Since the university serves as the main collection point for the caps, it has become a venue of visitors from around Kosovo who deliver their collection to the campus. RIT opened the university in Pristina 2003 in an effort to help Kosovo rebuild after the Yugoslav Wars of the 1990s. Fore more news from the American University in Kosovo, go to www.aukonline.org/blog. Croatia has a treasure trove of historically significant manuscripts, but after 800 years of fading ink and worms eating their parchment, much of the text has become impossible to read. Scientists from RIT are using multispectral imaging to make the writing legible once again and preserve the important information the manuscripts hold.